No matter what I do I can not get lcdproc to start. If I try to launch it from the services menu it just says "Stopped"
Which did you install LCDproc or LCDproc-dev? I don't have the HW to test properly, but the LCDproc-dev installed OK for me. When I start it, it fails gracefully because it cannot find the bogus hardware I configured. Webgui gets it right, showing it's not running. But /usr/local/etc/LCDd.conf definitely exists, is readable, and has correct-looking content in my tests. I did notice that lcdproc does show up in the status_services.php page, but not in the services widget on the dashboard page. <– seems it shows up on the widget if you tick 'enable at startup', but shows up in status_services in either case. Also, the latest seems to be 0.5.6 according to the links on the pfsense package page, not sure where you are seening 0.5.7. 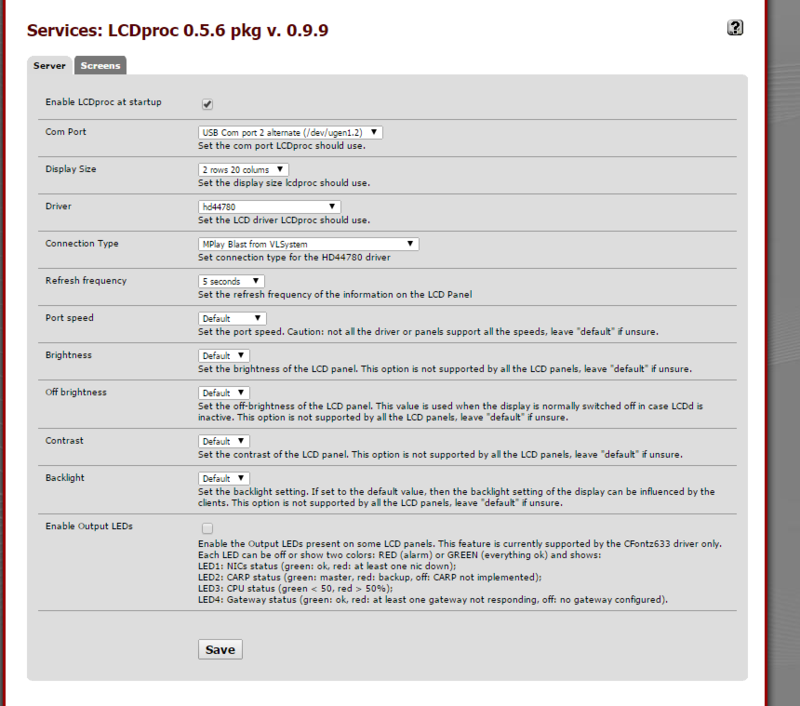 0.5.6 is the latest lcdproc stable release but there is a 0.5.7 version avilable. It hasn't made it into a pfSense package yet though. 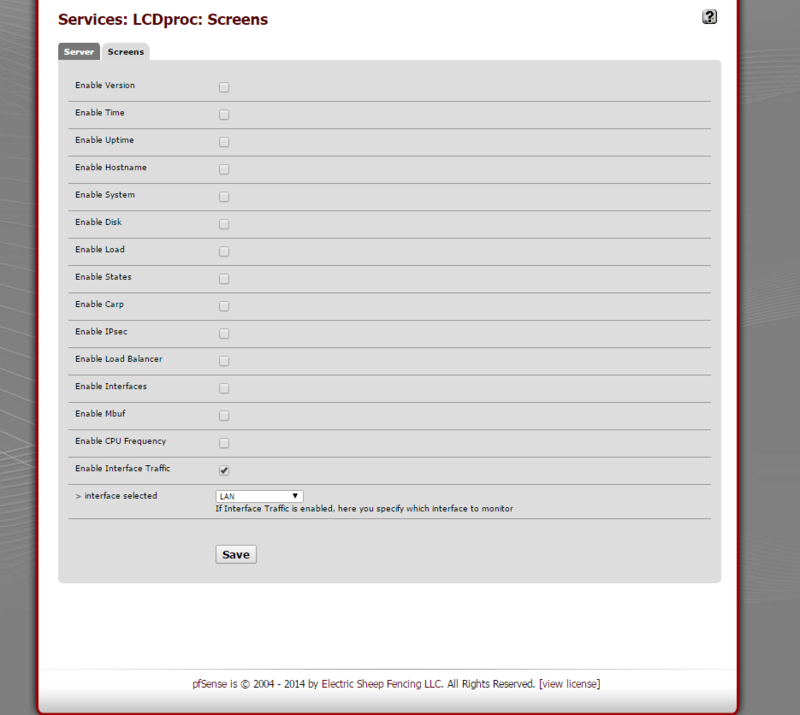 When you first install the lcdproc package it will not run at all until you have configured both a hardware type and some screens. Doing that generates the rc files required to start it. I have tried both versions in the pfsense package system. Are you running all of this on 2.2beta 64bit? Are you sure that's the right endpoint and device number? Can you increase the debug output level with "-r 5"? (Do it on the command line; setting it in the config file won't work if the file is not found or processed correctly). Also, when you try running it from the command line, put in the full path to the config file with the -c argument. It does not matter if I put anything on the command line or use full paths I still get the same "Could not read config file:" Even when doing -r 5 on the command line I do not get any additional information. Seems to completely ignore what I tell it..
Long shot, but try a newer beta version. Today's snapshot uses FreeBSD 10.1 Release; you are using an early prerelease, and there've been quite a few FreeBSD changes since then. If you have the resources, you could see if you could duplicate the problem on a VM with either a fresh pfSense or a vanilla FreeBSD 10.1 image. Ok, I've tested this using a recent snapshot and I was able to start it. How are you generating the LCDd.conf file? My LCDd.conf file already existed and compares exactly to the one you attached in the hardware thread. Same here. latest 2.2 beta i386. Same error. recreated LCDd.conf by hand using vi. permission are ok. LCDd cannot read config file. Very weird. Need dev to drive the firebox display. Having said that, I tried the non dev version of the package. LCDd is same version and it cannot read the config file too. not in the /usr/local/etc directory or doesn't matter if I create the config anywhere else. Tried with the config created by pfsense and also recreated it from scratch using vi. even chmod 777 the file just to make sure it did not need write privileges on the file. My pfsense is i386 since it is on a firebox x-core-e. This is too bad as I have the firebox all tweaked up on 2.2. NICs blinking right, your fan control and status light program working like a charm and even IPV6 with 6RD now working. A working LCD is what is missing now. I read on a previous post of yours that it is working for you. Was it a new install? My is an upgrade from 2.1. It shouldn't matter though. I wonder if LCDd is using some weird library that is screwing things up. Hmm. I updated my xtm5 today and after a couple of reboots the LCD came back up. It's running 64bit though. I have the filesystem set to permanent read-write. I can't really see what bearing that might have here but it's an easy test. I'll have to fire up my test x550e and put 2.2 on it. If you have time, let me know how it goes. I am curious. I think it is a problem with the LCDd executable. Wonder if a fresh install would help. Although a fresh install vs update should not make any difference. Ok, I upgraded my test X550e to todays snapshot (32bit obviously) 1G NanoBSD. After the upgrade the lcdproc-dev package was not re-installed installed because it's not signed. I set the allow unsigned packages check and installed lcdproc-dev and rebooted. It came back up no problem. I did nothing else. That's suing the same LCDd.conf file and Shellcmd instructions that were carried across the upgrade from 2.1.5. It's working fine for me both 32 and 64bit. Still having the problem. In my case the package was reinstalled after upgrade from 2.1 (after that deleted and reinstalled numerous times). Where do you set to allow unsigned packages? I didn't have to do that and maybe this is the problem. If you don't have that checked it should fail the install in a pretty obvious way with authentication errors. The fact that yours didn't must surely be clue, or maybe that mine did. Perhaps you have a cached pbi? That shouldn't be possible on Nano though. Are you running Nano? Yes, I had the install unsigned package already checked. I guess it carried over from the upgrade. I am running nano 4gb i386. At this point I guess the only thing left is to try a fresh install. Don't know if it is going to help. My understanding is that all of the freebsd comes with the new nano image, configuration file get upgraded to the new version and packages get reinstalled during upgrade. No system software other than what is in cf/media get carried over. I am puzzled to say the least. Where do you set to allow unsigned packages? I didn't have to do that and maybe this is the problem. Don't change that, the packages are signed. The installation would completely fail with a signature error if that were the issue. There is definitely some kind of issue with that package. I'm getting the same error that it can't find the config file, though it's there and permissions are such that it's readable by that process. I don't have anything with a LCD, not something I use. Hmm, something very odd happening here. It definitely failed to install with an authentication error and then installed fine after I allowed unsigned packages. That was a few days ago though. It's definitely running fine now using whatever binary was installed by the update process when I went to todays snapshot. Both the machines I've tested this on were upgraded from 2.1.X so I don't know if I've got some hangover. I've never set a different package server but I guess that would do it. Oh, some time back it could have. All PBIs were rebuilt within the past 3-4 days, there were some stragglers that hadn't been updated recently until then, and hence weren't signed. At this point, every PBI should be signed. I haven't found any that aren't. lcdproc-dev is not signed. Maybe since it is a dev version it will never be. Oh, sorry, indeed the dev version isn't signed. Is there a reason the dev version is an older lcdproc than the stable version? Seems odd. When the dev version was created it was to add new drivers and update the lcdproc base version. At the time the existing package hadn't been updated for a while and was way behind the current lcdproc. If the original package has been updated it may be time to consolidate the two. The sdeclcd driver has been included upstream so it may already be in the original package. There were some changes made in the -dev package which seemed like a good idea at the time but in retrospect may not have helped.